Bvlgari Aqua Marine Pour Homme After Shaves, EDT and Body Care. Bvlgari Aqua Marine Pour Homme is a vibrant and invigoratingly luminous journey to the heart of the marine world and the precious deep sea stones that inspired this unique fragrance for men. Bvlgari Aqua Marine Pour Homme feels like the transparent color of crystalline waters on the skin, a fresh and subtle breath of sea air with a different effervescence like the sparkling play of light on the water's surface. Bvlgari Aqua Marine Pour Homme opens with neroli and grapefruit and a heart of aquatic plant reinforced by rosemary blossom, white cedar and mineral amber at the base of the fragrance. 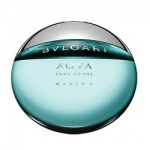 Bvlgari Aqua Marine Pour Homme is a vibrant and invigoratingly luminous journey to the heart of the marine world.